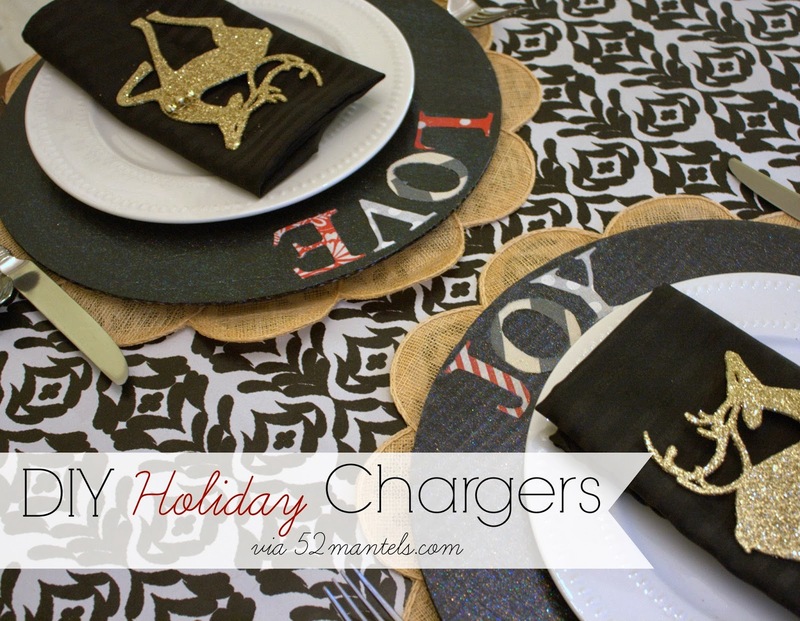 Hi, I’m Emily from 52 Mantels and I am SO excited to share this tutorial for DIY holiday chargers (made from cardboard cake circles!). 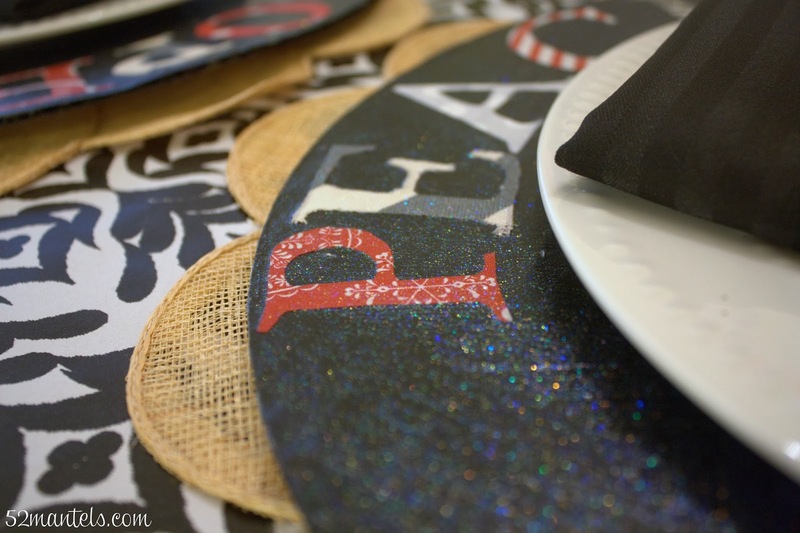 These are such an inexpensive way to add a little interest to your festive holiday tables. 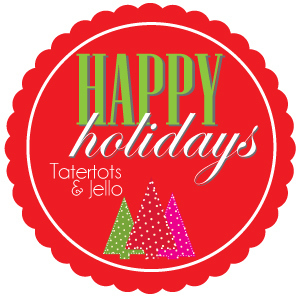 And, who doesn’t love a festive table?! 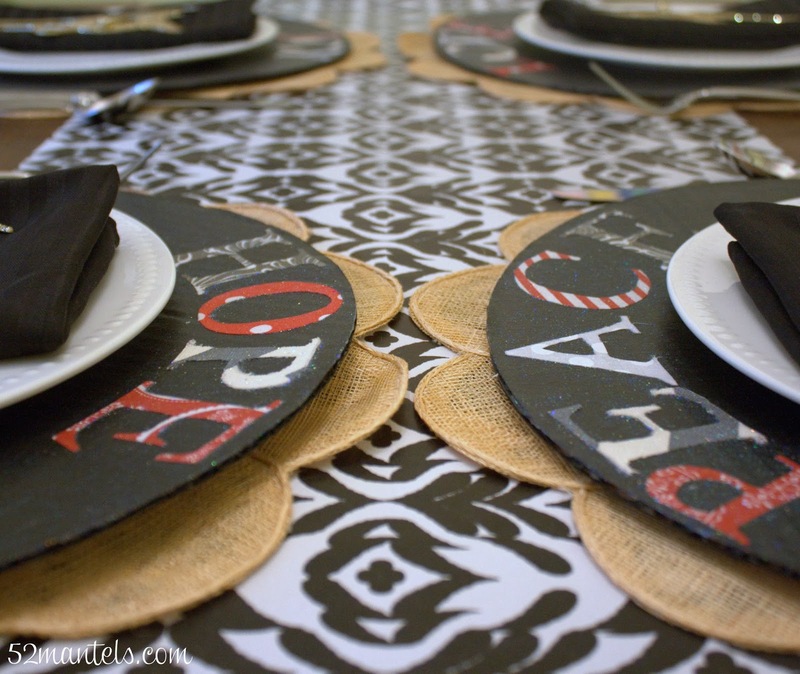 Paint the backside of your cake circles with black paint. Let dry completely. Gather fabric scraps and cut into squares. Trace each letter onto the backside of fabric squares- one letter per square. Be sure to flip letter backwards so that it’s facing the correct position when you flip your fabric! To attach the letters to the black chargers, apply a thin layer of matte decoupage glue to the top of your charger. Arrange your letters appropriately. Paint over the entire charger with the matte decoupage glue. Let the glue dry to the touch. Go over the charger again with your glitter decoupage glue. Let the glue dry completely before using. When these are completely dried and cured, you should be able to use a very damp cloth to wipe off any food spills. Of course, the glitter decoupage is totally optional, but I think it adds a nice, shimmery touch! I can’t wait to see how the candle light catches it on Christmas night. It’ll be so pretty, don’t you think? I like these so much, I’m thinking about making something similar for Thanksgiving. Or, maybe just for all-year use. The possibilities are endless! Come visit me sometime at 52 Mantels. I’d love to see you there! 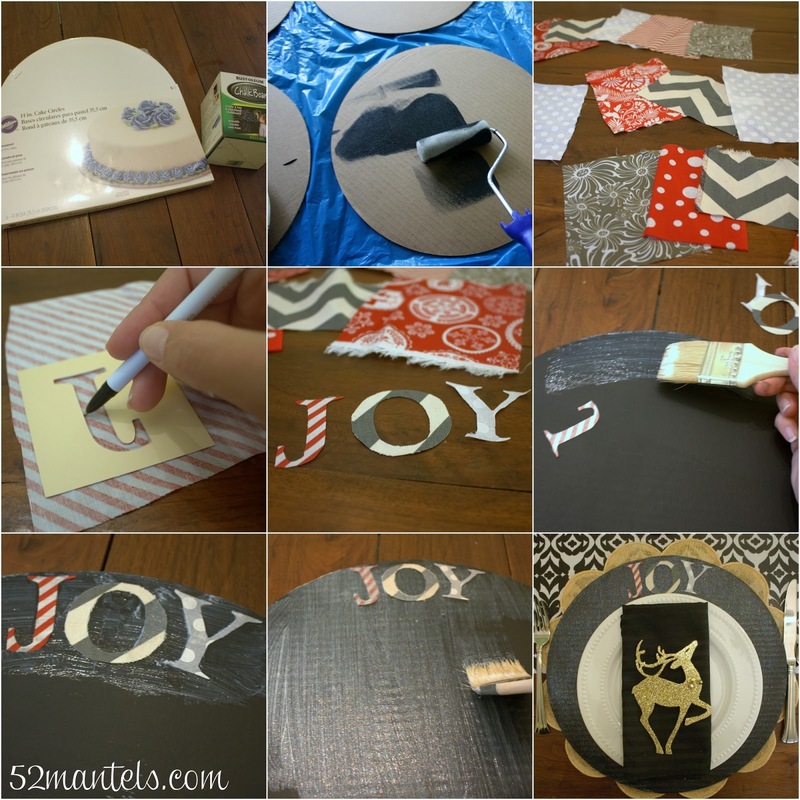 52 Mantels is a blog about all things home including occasional mantel makeovers, easy DIY projects, seasonal crafts and simple recipes! I’m blessed to be the stay-at-home mother to one adorable little girl and the lucky wife to an ever-supportive hubby (who puts up with my endless projects!). Thanks Emily! 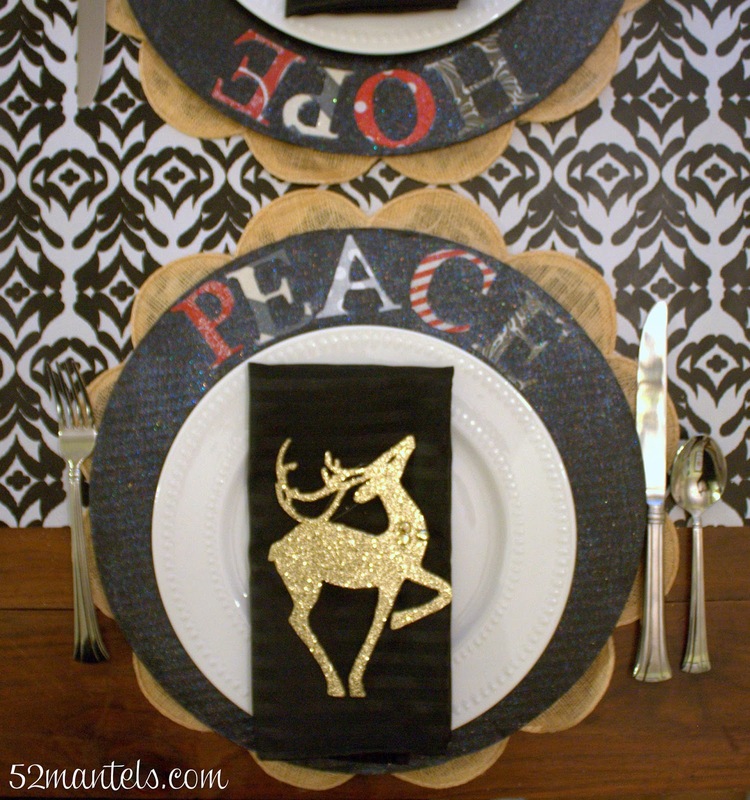 What a great and inexpensive way to make your holiday table look more festive! Check out 52 Mantels for tons of other great ideas too! 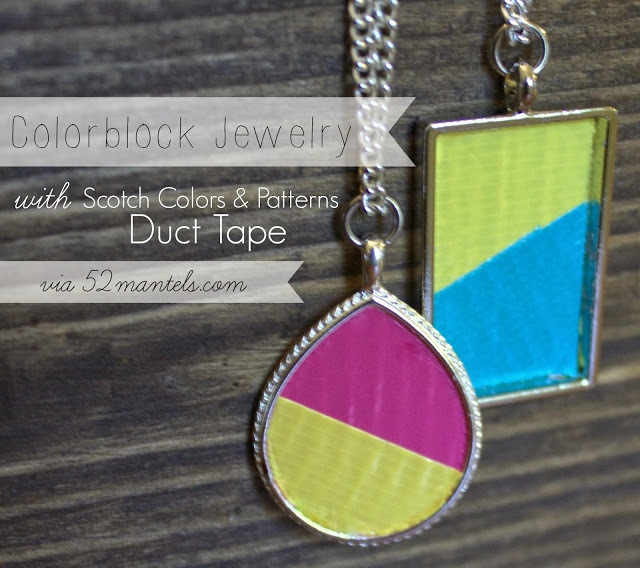 This Colorblock Jewelry she made is a great way to add color to an outfit!! And, she made it out of duct tape! How awesome is that? This could be a fun gift idea for your teen/tweens’ friends! 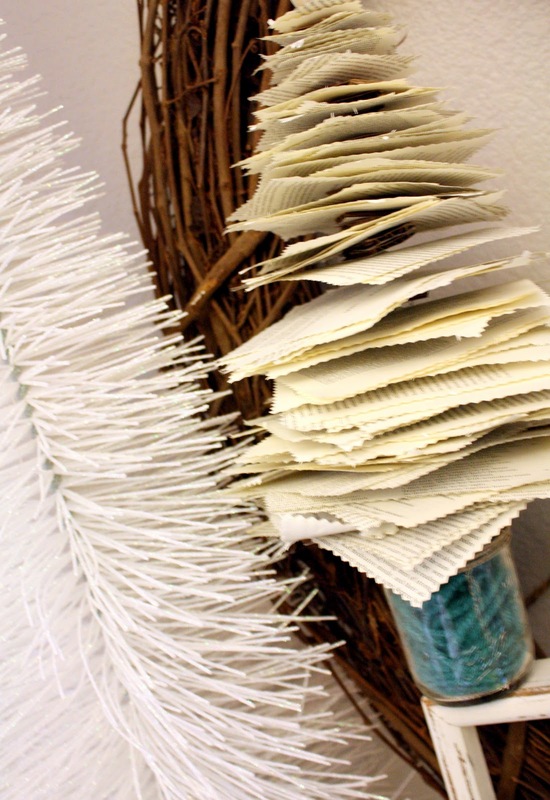 This Anthropologie Inspired Paper Christmas Tree is so creative and simple! I also love her plate wall! The colors are fantastic! Hola! I’ve been reading your blog for a while now and finally got the courage to go ahead and give you a shout out from Atascocita Tx! Um, you’re calling painted cardboard a charger? Dude, how *very* budget. Cute idea! What are the gold scalloped items under your chargers? Would use those as placemat chargers at our next soirée! Thank you! I just found my next project. That would be the best for Thanksgiving! 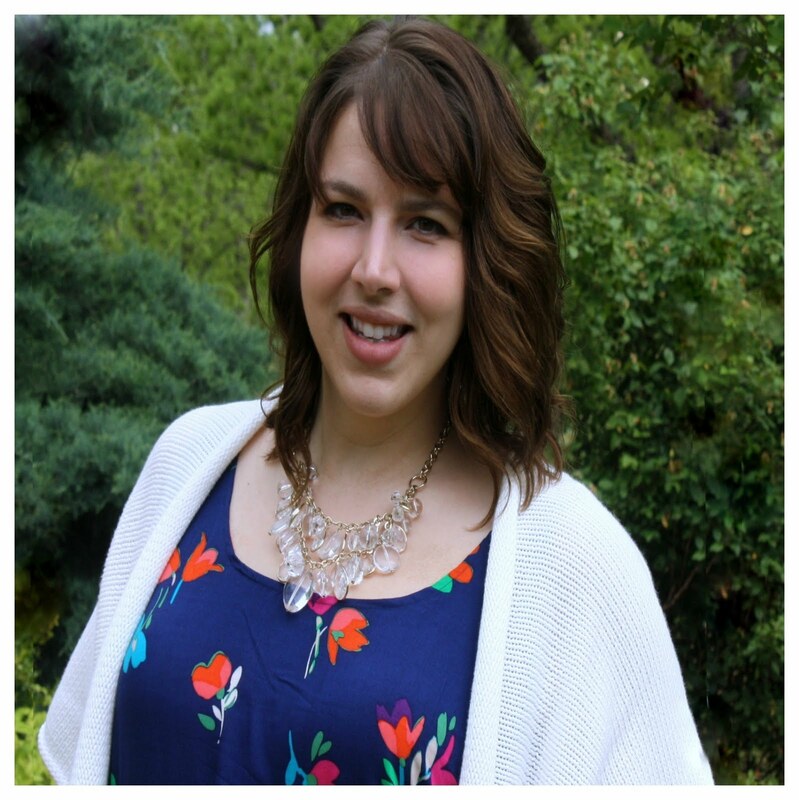 Amy Gable recently posted…7 Years of Bliss! What a fun idea! I love those napkins with the reindeer. Is the reindeer apart of the napkin or just sitting on top? Either way, love that idea! Such a great idea Emily. Thanks for sharing it!! Emily, your chargers are such a great idea! I love that you can customize them with whatever decorations fit your decor for the season. Well done!